Burgers are possibly the most ubiquitous meal on Americans’ dinner plates, but they’re also among the most resource-intensive: Beef accounts for nearly half of the land use and greenhouse gas emissions associated with the food Americans eat. 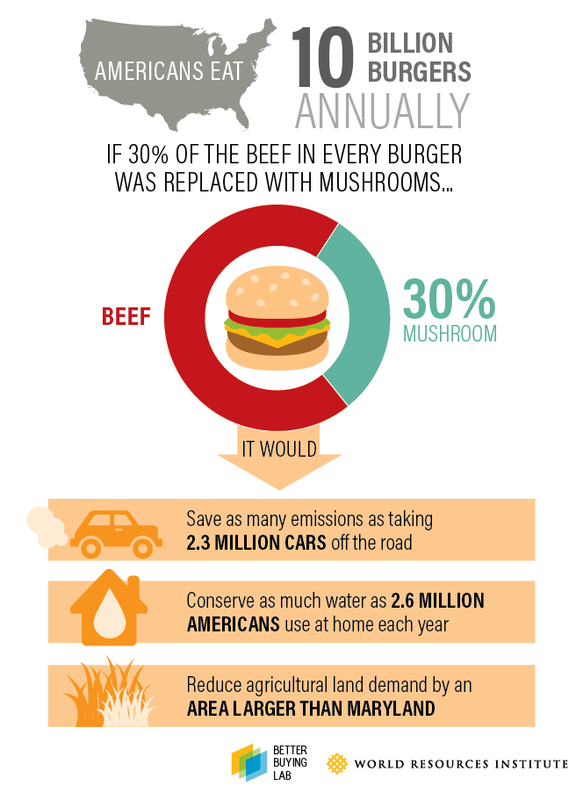 Although there’s growing interest in plant-based burgers and other alternatives, for the millions of people who still want to order beef, there’s a better burger out there: a beef-mushroom blend that maintains, or even enhances, that meaty flavor with significantly less environmental impact. Reduce global agricultural land demand by more than 14,000 square miles, an area larger than the state of Maryland. The Culinary Institute of America and others recommend blending plant-based foods into meat-based dishes as one way to shift mainstream consumers’ diets without requiring lifestyle changes. Mushrooms have a meat-like texture, moisture retention properties and an umami taste that can enhance the burger’s flavor while enabling chefs to also cut back on salt. Beef-mushroom burgers can also be lower in calories and saturated fat than all-beef burgers, making them a healthier choice. Across a variety of important consumer attributes—including flavor, texture, appearance and the ability to make a consumer feel full at the end of the meal—the beef-mushroom blended burger stacks up favorably to a conventional all-beef burger. Blended burgers represent an exciting sustainability opportunity for restaurants and food service operators, as beef accounts for a sizable portion of these companies’ greenhouse gas emissions. McDonald’s, for example, estimates that 28 percent of its corporate carbon footprint—an amount similar in size to the footprint of its energy use across all of the company’s restaurants and offices—results from beef production. Similarly, agricultural supply chains tend to account for 90 percent or more of a food company’s total water footprint. Beef production is a particularly thirsty water user, requiring more irrigation water per pound of product than any other animal-based food. With companies increasingly setting science-based emissions-reduction and water-stewardship targets, the blended burger is a sustainability strategy that could sit alongside renewable energy, energy efficiency, water efficiency and waste reduction measures. Encouragingly, the beef-mushroom blended burger also appears to not increase costs for food service operators. Effects on costs and profitability will depend on the relative prices of beef and mushrooms, the effects on meal preparation time, necessity for additional chef training and kitchen equipment, and the listed price of the blended burger on menus. A 2014-15 trial in a Baltimore public school suggested that the blended burger could be at least cost-neutral compared to traditional beef burgers. Over time, if meat producers and distributors sell pre-prepared blended burgers, economies of scale could make the blended burger an even more attractive business proposition to food service. The blended burger is already starting to gain traction across the United States. Last month, Better Buying Lab member Sodexo introduced “The Natural,” a beef-mushroom blend aimed at meeting increasing consumer demand for sustainable foods with a lighter footprint. It will go into full-flavored dishes like burgers, lasagna and chili in workplaces, universities and other settings across the country. Another Lab member, Stanford University’s Residential & Dining Enterprises, has been exclusively offering blended burgers in their operations for several years. And in mid-2017, Sonic became the first national burger chain to join the trend, trialing Sonic Slingers—their “juiciest burger ever”—at locations across the country. WRI’s Better Buying Lab is working with member companies and partners in the culinary world to refine and scale this remixed burger across the market. This includes researching and testing improved names that could further drive demand. The potential is so great that the Lab is pursuing the blended burger as one its three core Power Dishes, which are more sustainable menu items with the kind of appeal and familiarity to go mainstream. Shifting to healthier and more sustainable diets does not always need to mean overhauling people’s lifestyles. The blended burger is a nice example of a potential “multiple win”—better for the environment, better for health and enjoyed by consumers. Blending plants into burgers is only a start. Consider that only about one-third of ground beef is consumed in the form of burgers in the United States. If plants were mixed into all ground beef dishes—tacos, chili, lasagna, meatballs, pasta sauces and so on—the total potential environmental benefits could be much higher. Meat producers and distributors, restauranteurs, chefs, food service operators and retailers all have a role to play in serving up this delicious strategy for change.